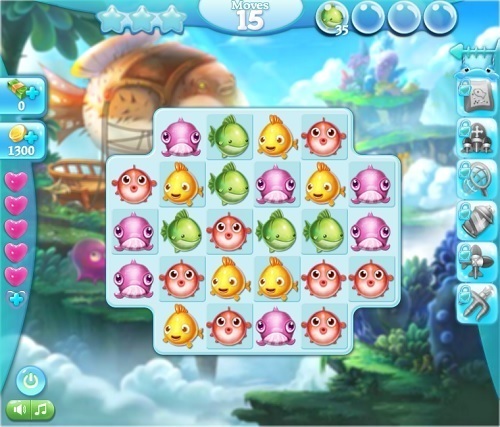 Fish Epic takes the 3 match puzzle genre under the seas in an adorable and fast paced offering. Within just a few minutes you’ll see why this game has attracted millions of players. The game is played through Facebook and features everything that you’ve come to expect from the genre. While on the surface it’s easy to write the game off as just a clone it’s got some unique elements that will keep bringing you back. Overall Fish Epic is fairly simple, you’ll travel through over 100 levels as you try to collect all the fish that you need. While this starts with you only requiring a single colour it quickly challenges you to collect a certain number of two, three and finally four fish. Because you also have limited moves for each level you can’t just match away without thinking strategically about each move. In order to clear fish from the board and collect them you’ll have to swap adjacent fish (a mechanic that nearly everyone will be familiar with). Every fish has bright graphics and a wonderful popping sound to make the game a visual and audible treat from start to finish. If you’re able to line up four or more fish you’ll get special rockets that can clear entire lines to help you beat the harder challenges. These are activated just by clicking on them which makes them extremely easy to use or save for when you need them. If you do find yourself getting stuck you can also access some powerful power-ups from the trident that lets you clear a single pesky fish to the colour net that lets you grab all the fish of a certain colour. You’ll also be able to spend the currency you earn for completing levels (gold coins) on boosters for that particular level which offer extra moves or larger explosives. Of course like most Facebook games you’ll want to get your friends on board with all sorts of benefits for playing with friends and sharing your successes (high scores) with them. The game isn’t impossible to finish playing alone though, it just makes the experience more fun as you compete against your friends. 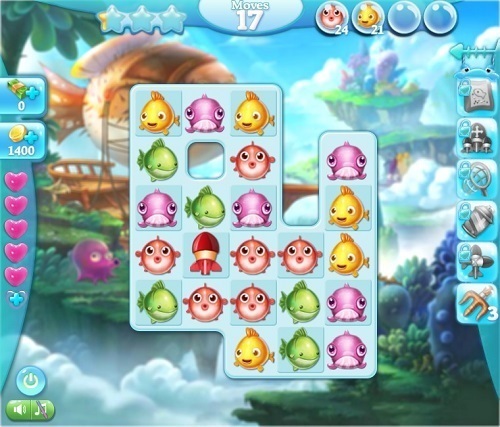 A fish based puzzle matching game. Collect fish in each level with a limited number of moves. Plenty of powerups and boosters available to help you complete each level. Played by over 1 million people.